Reels with printed colorful images are the visiting card of every casino slot machine as well as of the entire gambling industry. For a very long period of time all slots were equipped with mechanical reels that displayed and identified the result of the game. In spite of the fact that original slot machine had 5 reels which were easier and more reliable to interact with, 3 reel slots confidently conquered the gambling market. The problem of 3-reel slots is in the number of symbol combinations which amount only to 1.000 possible junctions. This restricts the abilities of producers to offer greater jackpots which are the best mean to attract gamblers to gaming. The highest theoretical payout if to consider 100% return would be 1000 times/bet but this is quite boring and leaves no space for other gamblers. However, recently the quantity of symbols grew to 22 thus allowing nearly 10.000 combinations. But still the volume of jackpot and possible winning combinations is limited. At all times providers of slots introduced various innovations in order to update their production and promote gambling to the next level. As well they tried to satisfy the demands and needs of gambling audience in order to keep existing clients and attract newcomers to land slots. In the end of 20th century producers of slots introduced electronics into their creations and programmed the machines to weight certain symbols therefore improving potential problematic aspects. An important gambling event took place in 1984 when Mr. Inge Telnaes got the patent that was named "Electronic gaming device utilizing a random number generator for selecting the reel stop positions". It allowed enormous jackpots and other magnificent odds for players. This was a breakthrough in gambling industry and the world of casino slot machines could never be the same again. Slot Machine Reels: the Necessity or Decoration? It is necessary to mention the function of reels in the modern gambling. In the past drums performed very important functions and used to spin in order to come up with certain combination of symbols. 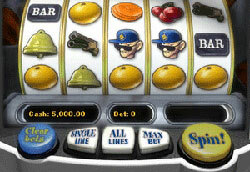 Modern gambling technologies allow video slot machine reels and online interface games without the necessity to pull the handle but simply click the appropriate starting button. But when it comes to land-based slot machines, one should remember that handles as well as reels at most machines are just made for attractive look of slots and for the show. All the necessary counting work is done by modern programmed devices such as random number generator and other similar instruments that determine immediately the combination of symbols while you enjoy spinning bright images and wait for the outcome.